One of two plaques on teh Cuban American Friendship Urn in Washington DC. The plaque reads: "ESTA COPA FUE ESCULPIDA EN UN FRAGMENTO DE LA COLUMNA DE MARMOL DEL MONUMENTO A LAS VICTIMES DEL "MAINE". ERICIDO EN LA CIUDAD DE LA HABANA, CUYA COLUMNA FUE DERRIBADA POR EL CICLON DE 20 DE OCTUBRE DE 1926." 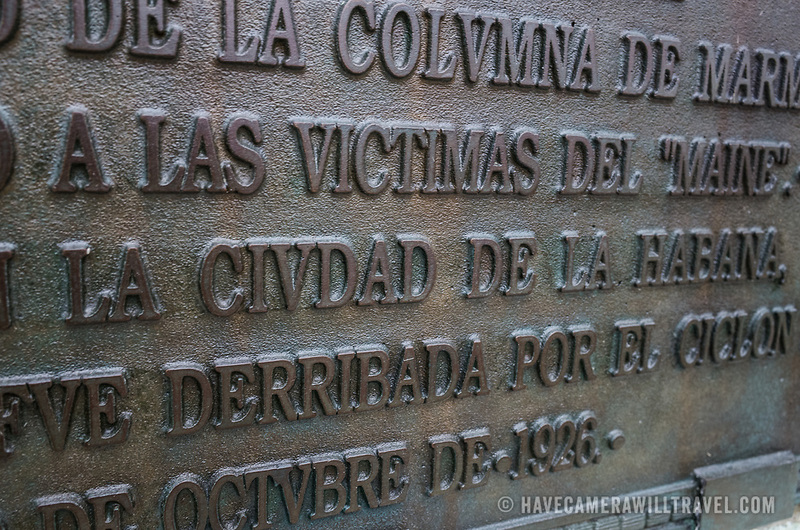 It translates as: "This urn was sculpted from a fragment of the marble column monument to the "Maine" victims killed in the city of Havana, whose column was demolished by the cyclone of October 20, 1926." Located in East Potomac Park in Washington DC, the Cuban American Friendship Urn is a 7-ton white marble urn carved from one of the columns that was originally part of the Maine Monument in Havana, Cuba, that memorialized the sinking of the Maine, an event that helped spark the Spanish American War and led to the independence of Cuba from Spain.